Building on their creation of the first-ever mechanical device that can measure the mass of individual molecules, one at a time, a team of Caltech scientists and their colleagues have created nanodevices that can also reveal their shape. Such information is crucial when trying to identify large protein molecules or complex assemblies of protein molecules. "You can imagine that with large protein complexes made from many different, smaller subunits there are many ways for them to be assembled. These can end up having quite similar masses while actually being different species with different biological functions. This is especially true with enzymes, proteins that mediate chemical reactions in the body, and membrane proteins that control a cell's interactions with its environment," explains Michael Roukes, the Robert M. Abbey Professor of Physics, Applied Physics, and Bioengineering at Caltech and the co-corresponding author of a paper describing the technology that appeared March 30 in the online issue of the journal Nature Nanotechnology. One foundation of the genomics revolution has been the ability to replicate DNA or RNA molecules en masse using the polymerase chain reaction to create the many millions of copies necessary for typical sequencing and analysis. However, the same mass-production technology does not work for copying proteins. Right now, if you want to properly identify a particular protein, you need a lot of it—typically millions of copies of just the protein of interest, with very few other extraneous proteins as contaminants. The average mass of this molecular population is then evaluated with a technique called mass spectrometry, in which the molecules are ionized—so that they attain an electrical charge—and then allowed to interact with an electromagnetic field. By analyzing this interaction, scientists can deduce the molecular mass-to-charge ratio. But mass spectrometry often cannot discriminate subtle but crucial differences in molecules having similar mass-to-charge ratios. "With mass spectrometry today," explains Roukes, "large molecules and molecular complexes are first chopped up into many smaller pieces, that is, into smaller molecule fragments that existing instruments can handle. These different fragments are separately analyzed, and then bioinformatics—involving computer simulations—are used to piece the puzzle back together. But this reassembly process can be thwarted if pieces of different complexes are mixed up together." With their devices, Roukes and his colleagues can measure the mass of an individual intact molecule. 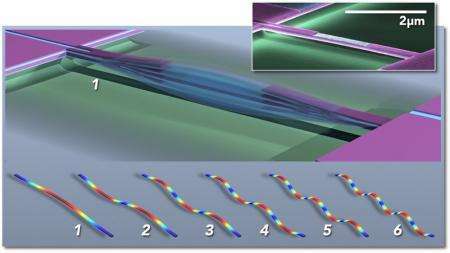 Each device—which is only a couple millionths of a meter in size or smaller—consists of a vibrating structure called a nanoelectromechanical system (NEMS) resonator. When a particle or molecule lands on the nanodevice, the added mass changes the frequency at which the structure vibrates, much like putting drops of solder on a guitar string would change the frequency of its vibration and resultant tone. The induced shifts in frequency provide information about the mass of the particle. But they also, as described in the new paper, can be used to determine the three-dimensional spatial distribution of the mass: i.e., the particle's shape. "A guitar string doesn't just vibrate at one frequency," Roukes says. "There are harmonics of its fundamental tone, or so-called vibrational modes. What distinguishes a violin string from a guitar string is really the different admixtures of these different harmonics of the fundamental tone. The same applies here. We have a whole bunch of different tones that can be excited simultaneously on each of our nanodevices, and we track many different tones in real time. It turns out that when the molecule lands in different orientations, those harmonics are shifted differently. We can then use the inertial imaging theory that we have developed to reconstruct an image in space of the shape of the molecule." "The new technique uncovers a previously unrealized capability of mechanical sensors," says Professor Mehmet Selim Hanay of Bilkent University in Ankara, Turkey, a former postdoctoral researcher in the Roukes lab and co-first author of the paper. "Previously we've identified molecules, such as the antibody IgM, based solely on their molecular weights. Now, by enabling both the molecular weight and shape information to be deduced for the same molecule simultaneously, the new technique can greatly enhance the identification process, and this is of significance both for basic research and the pharmaceutical industry." Currently, molecular structures are deciphered using X-ray crystallography, an often laborious technique that involves isolating, purifying, and then crystallizing molecules, and then evaluating their shape based on the diffraction patterns produced when x-rays interact with the atoms that together form the crystals. However, many complex biological molecules are difficult if not impossible to crystallize. And, even when they can be crystallized, the molecular structure obtained represents the molecule in the crystalline state, which can be very different from the structure of the molecule in its biologically active form. "You can imagine situations where you don't know exactly what you are looking for—where you are in discovery mode, and you are trying to figure out the body's immune response to a particular pathogen, for example," Roukes says. In these cases, the ability to carry out single-molecule detection and to get as many separate bits of information as possible about that individual molecule greatly improves the odds of making a unique identification. "We say that cancer begins often with a single aberrant cell, and what that means is that even though it might be one of a multiplicity of similar cells, there is something unique about the molecular composition of that one cell. With this technique, we potentially have a new tool to figure out what is unique about it," he adds. So far, the new technique has been validated using particles of known sizes and shapes, such as polymer nanodroplets. Roukes and colleagues show that with today's state-of-the-art nanodevices, the approach can provide molecular-scale resolution—that is, provide the ability to see the molecular subcomponents of individual, intact protein assemblies. The group's current efforts are now focused on such explorations. Scott Kelber, a former graduate student in the Roukes lab, is the other co-first author of the paper, titled "Inertial imaging with nanoelectromechanical systems." Professor John Sader of the University of Melbourne, Australia, and a visiting associate in physics at Caltech, is the co-corresponding author. Additional coauthors are Cathal D. O'Connell and Paul Mulvaney of the University of Melbourne. The work was funded by a National Institutes of Health Director's Pioneer award, a Caltech Kavli Nanoscience Institute Distinguished Visiting Professorship, the Fondation pour la Recherche et l'Enseignement Superieur in Paris, and the Australian Research Council grants scheme.